I’ve got other, more important stuff to do today. No change there, then – but faced with a need to scale down my obsessive post-referendum news/social media fixation, I must conjure up a fresh displacement activity. And so, as “She’s My Gal” has been in my direct line of vision for the past three months, patiently stacked behind the office hi-fi, perhaps it’s finally time to dispatch it back to its rightful resting place around the corner, nestling between The Go-Go’s and Gorky’s Zygotic Mynci. In the autumn of 1976, impatient for the arrival of UK punk on record, I was casting around for the nearest substitutes. Six years ago, writing about Dr. Feelgood in The Guardian, I made mention of this transient phase. For those of us who were impatient for British punk rock to make the leap from enticing music-press buzz to ­tangible vinyl product, Dr Feelgood and their compatriots at the rowdier end of the pub rock scene – Eddie and the Hot Rods, Count Bishops, Tyla Gang – were as close an approximation as we could find to the music we had read about, but could only piece together in our imaginations. Ahead of the punk eruption, these John the Baptist figures were leading the charge, showing that rock music could be reinvigorated by a high-energy, no-nonsense, back to basics approach. 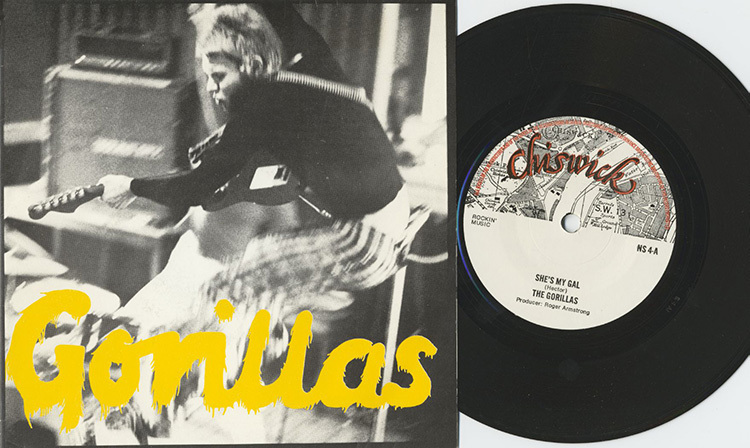 And so it was with The Gorillas, an equally rowdy product of the London pub-rock circuit, and this release for one of the UK’s first independent labels, Chiswick Records. Having already hoovered up as much as I could find from the Stiff label – Nick Lowe, Tyla Gang, Lew Lewis and, most crucially of all, The Damned – I was now turning my attention to their spiritual counterparts, and “She’s My Gal” duly became the second of five near-consecutive purchases from Chiswick (a run that was only broken by “Anarchy In The U.K.”). As much a perpetuation of bovver-glam as a prefigurement of punk, the catchy swagger of “She’s My Gal” bridged my listening gap more ably than most. I shall place it back among the G’s with fondness. Elaine Hudson had made her mark in 1989, duetting with Sydney Youngblood on the title track of his successful debut album Feeling Free. Now it was Youngblood’s turn to return the favour, supplying incidental vocals on Hudson’s first single. Indeed, the whole Youngblood songwriting and production crew were pressed into Hudson’s service, with Youngblood himself taking a co-writing credit. 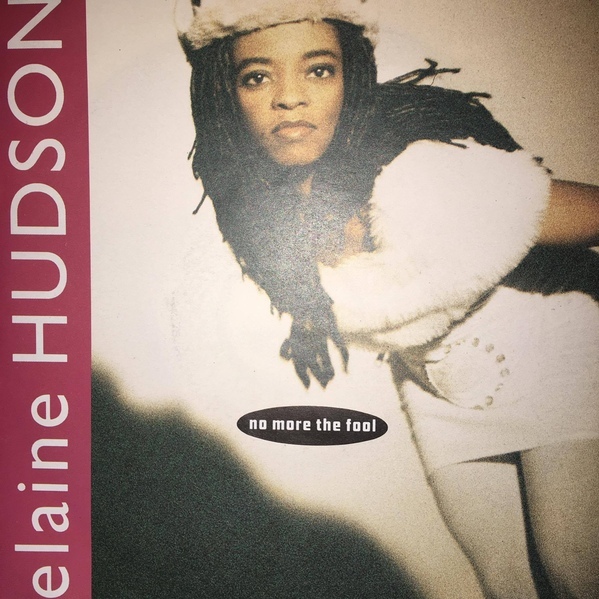 In its 12-inch incarnation, “No More The Fool” is an amiable, well-sung pop take on classic soul tropes, with pleasing piano and strings, that’s only marred by the inclusion of that Soul II Soul rhythm track, which had become ubiquitous around the turn of the Nineties. In this respect, Team Youngblood – and producer Claus Zundel in particular – had previous form, drawing criticism for their heavy reliance on Jazzie B’s signature sound. Cocking a snook at the finger-waggers, they had even released a “Jazzy Who?” remix of “Feeling Free”, which committed further acts of plunder. And of course, there was Youngblood’s big hit “If Only I Could”, whose backing track is barely distinguishable from Raze’s “Break 4 Love”. As shameless as these lifts might have been, at least they were competently executed. But with the 7″ remix of “No More The Fool” – which is the version I own, and you’ll search in vain to hear it online – the machinery jammed. Ditching the Soul II Soul rhythm, Zundel smothered the song with a generic James Brown breakbeat, mixing it so high that the rest of the track fades into murky near-inaudibility. Hudson’s vocals are so buried, that she might as well have been singing beneath six inches of soil, and Youngblood’s vocals are mixed so low that the ear struggles to make them out at all. In fact, the overall sound quality is so utterly, utterly terrible, that it beggars belief that this mix was ever cleared for release. Perhaps it sounded better on the CD single, but all I can hear is the thoughtless ruination of a otherwise pleasant song. It bombed, of course – and by the end of the year, Hudson’s major label recording career was over. She now works as a wedding singer in Birmingham, Alabama. She looks happy, and I’m glad about that. Two days on from Tina Turner, we’re back with the Finnish DJ’s job lot. This copy is a good deal less battered than “What’s Love Got To Do With It”, with a level of surface noise that’s easier to tune out. “Family Man” is the clear A-side, but for this European release, it’s been bundled with its predecessor “One On One”: an equally big hit in the US, which did much less well over here. 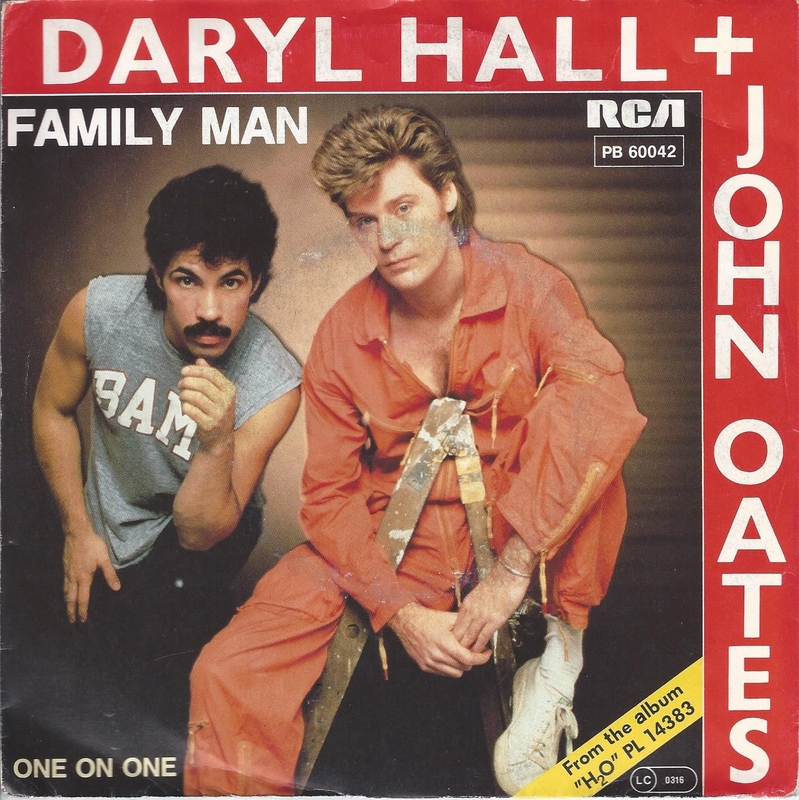 In 1983, Hall and Oates were at the peak of their success. H2O, the album which housed both these tracks, was their eleventh release and their biggest seller; it also gave them their fifth US chart-topper, “Maneater”. “One On One” is a gentler affair, more in the tradition of the duo’s blue-eyed soul style, with none of the A-side’s clenched rock bite. It’s a love song wrapped round a sporting metaphor, which talks of playing the game, setting the pace, taking time out and so on. If I’m sounding neutral here, it’s because I’ve always been basically neutral towards Hall and Oates. Their earlier work – with the exception of the heavenly “She’s Gone” – was too mature for my teenage ears, and their Eighties hits – with the exception of the equally heavenly “I Can’t Go for That (No Can Do)” – didn’t chime with my expectations of Eighties pop. That said, both tracks have worn well; history has been kind to this type of glossy AOR-pop, and it wouldn’t surprise me to hear “Family Man” at retro nights for cool millennials. So maybe it’s time for me to dig into those early albums – the first two produced by Arif Mardin, the third by Todd Rundgren – and close this gap in my knowledge. Yeah, I’ll stick them on a playlist. That’s what I’ll do. Six years after Back On The Block, an album which I loved and played a great deal, came its sequel: another journey through diverse styles of black music, both old and new, which was equally crammed with guest appearances from artists of all generations. On the 92-second intro, Jones’s guest roster reaches surreal proportions; 29 voices are heard, ranging from Marlon Brando to Queen Latifah, Dizzy Gillespie to Bono. We get the picture; he’s a well-connected guy. The trouble with this approach, though, is that the names threaten to distract from the music. You end up forever checking the sleeve notes, just in case a historic collaboration (Ray Charles and Stevie Wonder!) passes you by. Clocking in at 70 minutes, the album suffers from a certain amount of mid-Nineties fill-up-the-CD bloat; some tracks drag on too long, particularly the closing pair of “quiet storm” wind-downs, and some of the interludes could have been cut. The shiny, brittle, over-separated production also screams “Nineties CD” – you couldn’t ever imagine this on vinyl – but such were the times, and perhaps it’s unfair to slate a Nineties CD for sounding just like a Nineties CD. There’s also the issue of Sequel Syndrome, and diminishing returns. 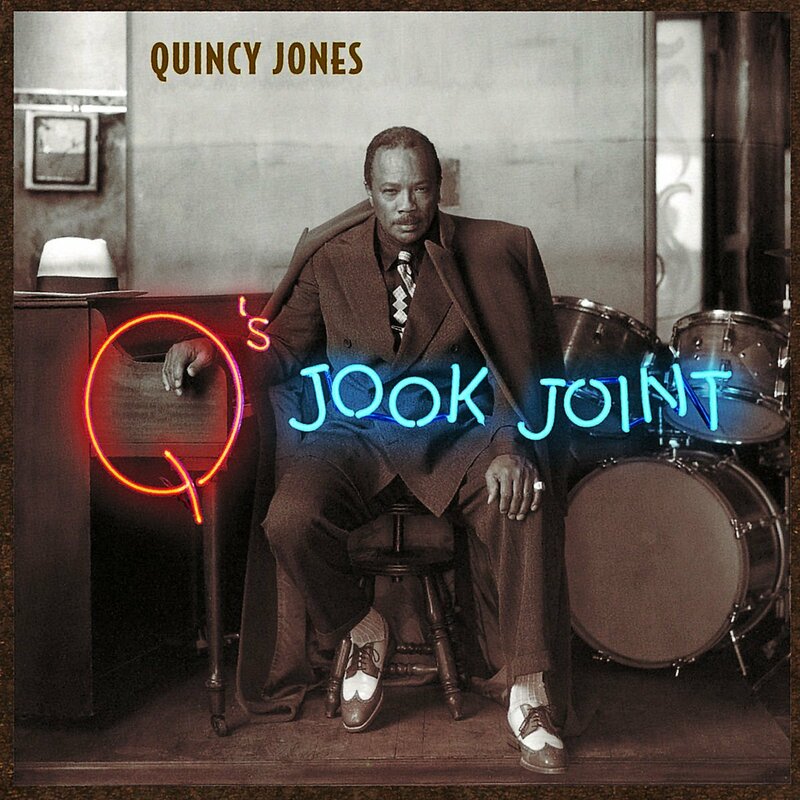 Where Back On The Block dazzled you with its scope, Q’s Jook Joint sometimes feels too worthy, too cosy, too respectful, too respectable. That said, there are, of course, plenty of delightful moments. With a cast this strong, how could there not be? I was reading only yesterday, in David Toop’s 1984 history of hip hop The Rap Attack, about the vocal freestyles that Eddie Jefferson created from jazz improvisations, and so was particularly struck by Brian McKnight’s fine update of Jefferson’s vocalese style on a reworking of James Moody’s “Moody’s Mood For Love”, complete with a sax solo from Moody himself. Later, I watched Phil Collins performing “If Leaving Me Is Easy” on a 1981 Top of the Pops, and found myself marvelling, quite despite myself, at the quality of the vocals, songwriting and arrangement. Collins guests here on Duke Ellington’s “Do Nothin’ Till You Hear From Me” – backed by a large brass section, with great solos from Joshua Redman on sax and Jerry Hey on trumpet – and he acquits himself commendably, which is a big surprise. Elsewhere, there are enjoyable covers of The Brothers Johnson’s “Stomp”, Michael Jackson’s “Rock With You” and Jones’s own “Stuff Like That”, the latter voiced by its composers Ashford & Simpson alongside Brandy, Ray Charles, Chaka Khan and The Gap Band’s Charlie Wilson. This must have been a massively demanding project logistically, but it’s also manifestly a labour of love, and you can feel that love shining all the way through. These are all people who Jones admires, from living legends to brand new talents, and no-one other than Jones could have brought them all together. Perhaps inevitably, the whole doesn’t exceed the sum of its parts – but you can only applaud its ambition and spirit. For Christmas, K gave me a copy of Eilon Paz’s sumptuous coffee table book, Dust & Grooves: Adventures In Record Collecting. Over the course of its 436 pages, a diverse array of record enthusiasts display and discuss their collections. In each case, you get the impression that every record has been lovingly curated, and that each collection can be viewed as a physical representation of its owner’s personality and passion. As for my own equally vast and sprawling collection, I couldn’t begin to make the same sort of claim. It’s not so much lovingly curated, as haphazardly accumulated. There are duds galore: random punts, impulse buys, bargain-bin hoovering exercises, ephemeral fancies, over-hyped disappointments, artist loyalties that stretched too far. Too often, I’ll pull out a record or a CD, and think to myself: what the hell is that doing here? And so it is with this battered copy of Tina Turner’s second comeback hit, which took her long-stalled career to new heights, turning her into a global superstar at the age of 44. What the hell is this doing here? I never cared for it much at the time, and I’ve never warmed much to it since. “What’s Love Got To Do With It” snuck into my collection in the mid-Nineties, as part of a job lot. A Finnish friend had moved to the UK, and was purging dead weight. He’d worked as a DJ, playing the hits of the day in his home city’s bars and clubs. Feeling generous, I swept through his stack of seven-inchers with a wide net, filling in gaps and erring on the side of “well, it might be useful to have this in stock”. These days, “tastemaker singles” are an established part of the promotional process. Put something out on a small label over the autumn, just in time to reach the “Sound Of…” voters, then hit the market big time in the spring, with a more commercial offering. Looking back at the Tina Turner campaign, it’s tempting to see something similar at work. Charting in November 1983, her first comeback hit, “Let’s Stay Together”, carried the cachet of B.E.F./Heaven 17 (who had also produced her cover of “Ball Of Confusion” a year earlier, on their critically acclaimed but under-selling Music of Quality and Distinction). Then, having primed us with a “Tina gets cool again” move, Capitol wheeled out the big guns. Producer and co-writer Terry Britten had a solid track record, having revitalised Cliff Richard’s career with “Devil Woman” and provided B.A. Robertson with a string of hits. 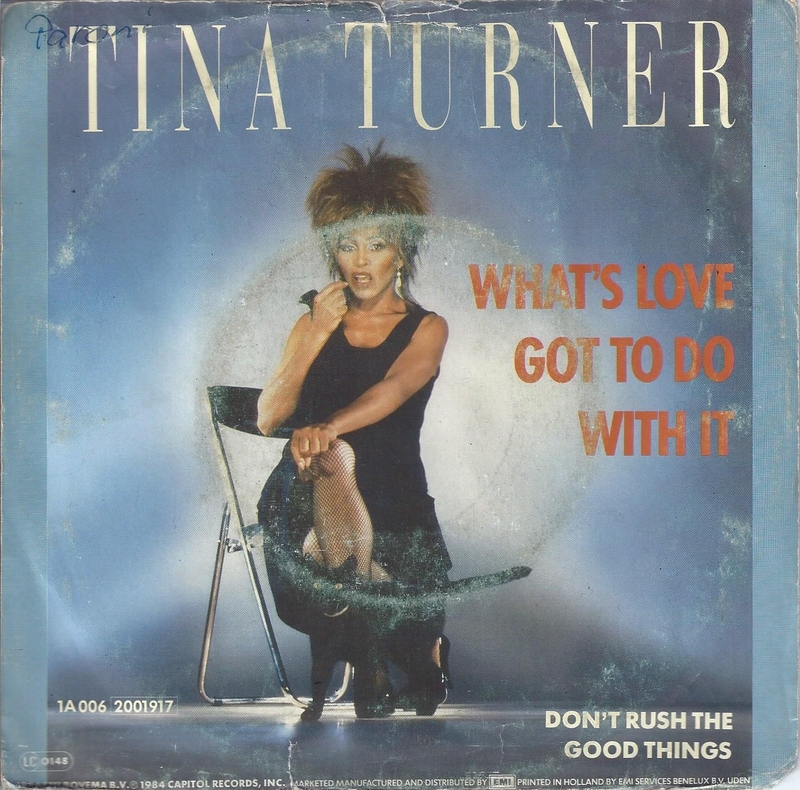 “What’s Love Got To Do With It” had already been hawked around a few acts – Donna Summer, Phyllis Hyman, Bucks Fizz – but it must have felt like a natural fit for Turner’s style: battle-hardened and bruised, yet still flirty and sassy. Who else could sell a line as breathtakingly cynical as “what’s love but a second-hand emotion”, while still hoofing and vamping and making you think: ah, good old Tina, I’ll buy into that? Well, that’s how I see it objectively – but in truth, Comeback Tina never moved me much. I hear showmanship, technique and personality by the bucketload, but I never get a true sense of soul. That rock edge to her voice? It’s the wrong sort of rock for me. I get the “what a gal, what a survivor, isn’t she great for her age” aspect, but I can get no further. Perhaps this song was given added autobiographical heft when it was chosen as the title of her 1993 biopic – but it hadn’t been written with Tina in mind, and the retro-fit came too late to convince me. Instead, my abiding Turner memory is of gazing blankly at her, stadium-strutting on a Pepsi TV commercial with the sound turned down, while playing Laibach’s cover of Queen’s “One Vision” and drawing the sort of parallels that only Laibach could induce. 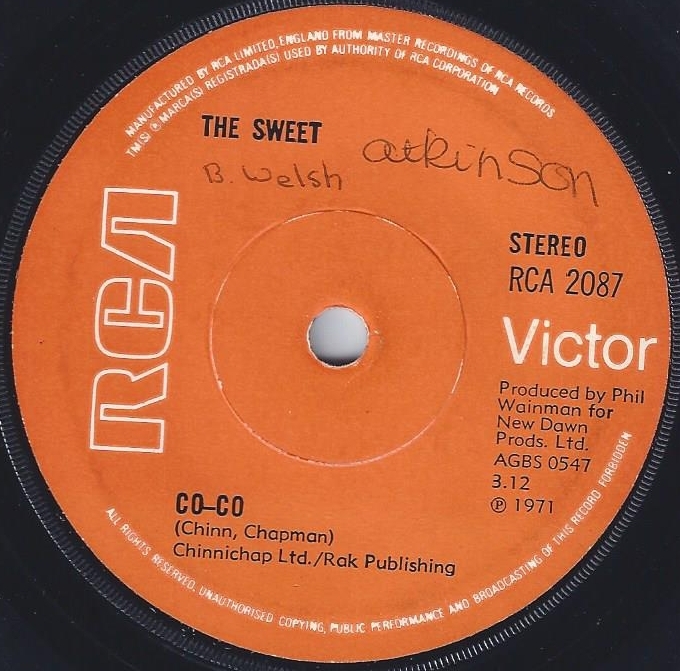 By most people’s yardsticks, it’s hardly a classic – quite the reverse, you might well say – but for nine year-old me, the UK singles chart of 1st-7th August 1971 marks the point where it all began. It was the summer holidays, and I’d just been given my first transistor radio, a source of constant fascination. I mostly kept it tuned to Radio One, whose daytime playlist exactly mirrored the top of the charts. Within a week or so, I could recognise the biggest hits within seconds – and could quote you their chart positions, too. T. Rex were spending their third week at Number One with “Get It On”, with its predecessor, Middle Of The Road’s “Chirpy Chirpy Cheep Cheep”, still hanging around at Number Three. I preferred the latter: super-catchy, but with an undertone of melancholy (this was, after all, a song about an abandoned child). The New Seekers had climbed to Number Two with “Never Ending Song Of Love” – those swoonsome doo-doo-doos and ba-ba-baas! – and there were two lilting, easy-rolling folk-country songs at Six and Seven, by Lobo (“Me And You And A Dog Named Boo”) and New World (“Tom Tom Turnaround”). Atomic Rooster were at Four with “Devil’s Answer”, a song containing a word that I literally didn’t dare to speak out loud; even “Good Heavens” was considered too sweary for our family back then, and I wasn’t going to take any risks. Songwriters Nicky Chinn and Mike Chapman, on the threshold of becoming major players, had two singles in the Top Ten. As well as “Tom Tom Turnaround” – the only single from this chart that I went out and bought, and indeed the first single that I ever bought – they had landed their second hit for The Sweet, two places above it. “Co-Co” had everything I wanted from a pop song: a distinctive intro, well-turned verses which exploded into a massively hooky chorus, a sunny arrangement (those steel drums! ), a high-pitched vocal that I could squeak along with, nonsense words (I was big on nonsense), bags of repetition, and a string of rising key changes could have carried on rising forever, well beyond the fade. A couple of years later, a copy of “Co-Co” turned up in our village, on a trestle table at a church fete, for mere pennies. I think my sister bought it; it’s her handwriting on the label, next to the original owner. Even then, it felt like a period piece; The Sweet had progressed from cod-calypso to full-on glam stomp, and so it paled in comparison to the might of “Blockbuster”, “Hell Raiser” and “Ballroom Blitz”. Meanwhile, The Sweet pursued a parallel path on their self-penned B-sides, which they claimed represented their true worth as a serious hard rock band, as opposed to purveyors of manufactured pap. But in truth, the sub-Deep Purple-isms of “Done Me Wrong All Right” are nothing worth shouting about. They finally got their way in 1974, on their second album Sweet Fanny Adams, dropping the definite article and reducing Chinn and Chapman’s contributions to a mere two tracks. There will be more on that if the randomiser permits.